We personally invite you to be our esteemed guest of honour on the happy occasion of the inauguration of our new office . 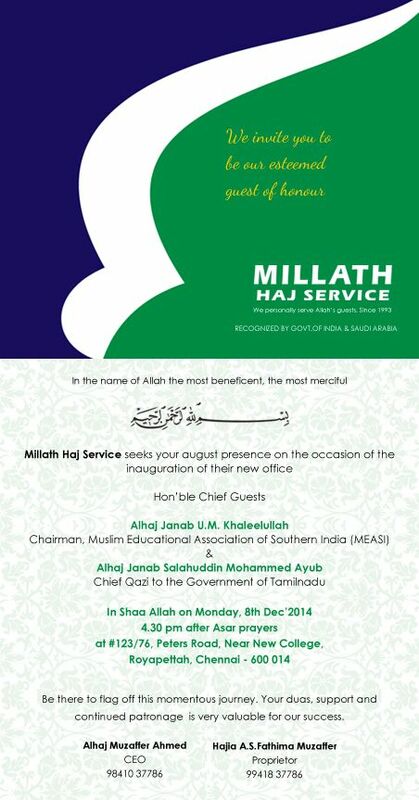 Chairman,Muslim Educational Society of South India. Chief Khazi Govt of Tamilnadu. Please be there to flag off this momentous journey.Your duas,support and continued patronage is very valuable for our success. Assuring you of our close cooperation and personal services always we conclude looking forward to meeting you on Monday 8th December 2014.In Shaa Allah.